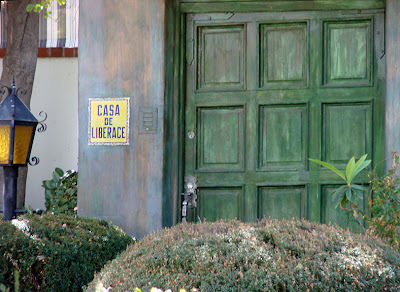 Ahhhh...Liberace's home. Grand, just like the man, a flamboyant pianist and, shall we say, "queen?" He died here at 68 after contracting AIDS in 1987. That would make this year (last month, really) the 20th anniversary of his death. To see all that was grand about the man, you gotta go to Vegas to the Liberace Museum. Just in case if you're into extravagant entertainers and never heard of the guy, you can see him here. What you have here is a 60s Mustang in the driveway of a 50s house. So mid-century! 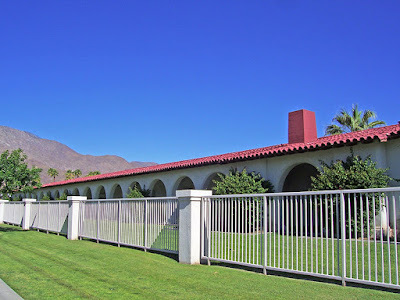 The neighborhood I live in, the Dumuth Park area was built to house the housekeepers, gardeners and other locals that served the rich people of Palm Springs (the rich live closer to the mountain). 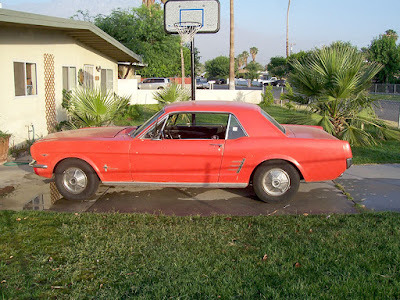 Since my neighborhood is largely Hispanic, you see a '65 Mustang here and there, cause the Hispanic men dig them from stepping on the gas down Ramon Road to working on the many problems it gathers over the years on the weekends. 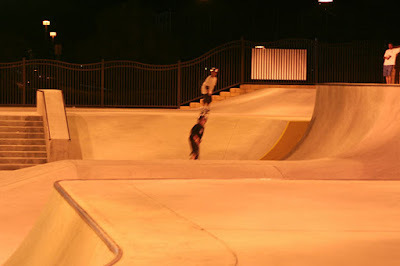 This is the Palm Springs skateboard park. 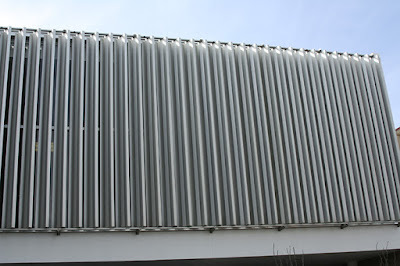 It was built a few years ago near the city swimming pool. 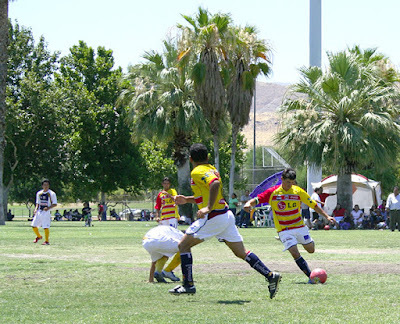 Palm Springs is well known for golf, but soccer is popular too, especially among Latinos. 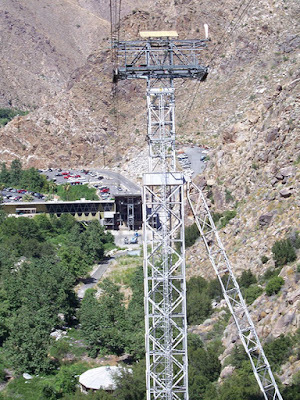 Rotating cars gliding up the mountainside among drastic changes in microclimates is the Palm Springs Aerial Tramway. The Valley Station is located in North Palm Springs, an area where the heat of the desert is less severe because the station is at 3000 feet. Once you get up to the Mountain Station the weather can be 30 degrees cooler than it is down below. Going up and down the tram is full of photo-ops of the sweeping Coachella Valley below. At the top, there are many hiking trails among the more temperate climate that hosts a forest of pine trees, and, during winter, snow--lots of it. Yeah, Anna Nicole partied here! This "A" frame wood driveway cover is "Tiki" architecture. Tiki was the Polynesian God people in the South Pacific revered. We rever him here too. It doesn't take much to find a scene like this in Palm Springs. If you want to mock this place you call it "Poodle Springs." At any rate, here it lives up to its name. Since this is modern week in Palm Springs, I'll remind everyone who comes here that a piece of modern Palm Springs is no farther than your digital camera. 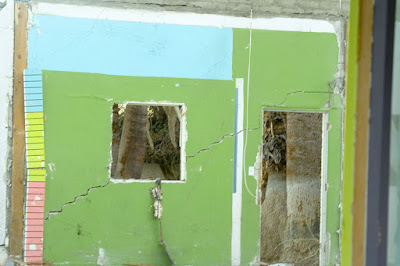 We've had some demolition going on our main drag, Palm Canyon Drive. About a dozen buildings have been removed in a several square block area of downtown. Unfortunately, a few were classic minimimalist structures. It was Indian land, though, so not much anyone could do about it. The pearl here is what I found when the demolition was almost complete, a colorful wall of tiles, paint and debris. I love art. It's a fact in Palm Springs if you see someone golfing, it's not likely to be someone who lives here full time. Most of the golfers are snowbirds, many of them Canadian. Albeit, other cities in the Coachella Valley have ten times the golf courses that Palm Springs does, and that is where most of the golfers hang out. On a personal note, I'm baffled by the sport. I don't play. 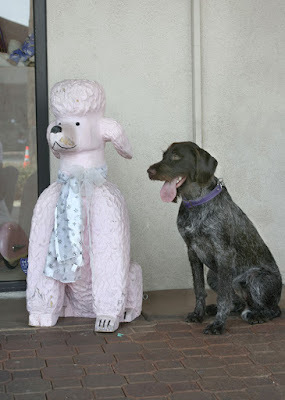 I've asked my good friend Doug if I could, maybe, play with him. No dice. I've asked my brother Louis if I can play with him. Still no dice. I just don't understand it. Maybe someone can explain why experienced golfers have such a hard time accepting beginners. I'm going to take a walk from minimalist architecture to minimalist art. 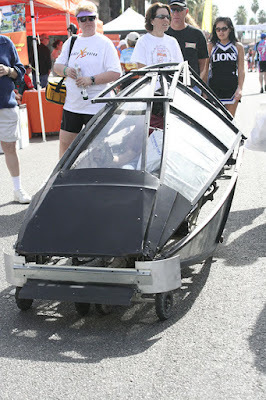 Check out the photo here, it's minimalist. In real life it's minimalist architecture. 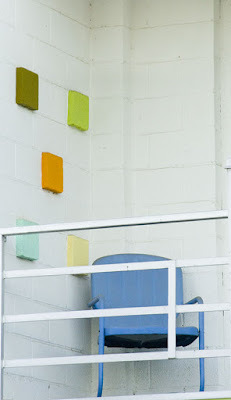 As a photograph it's minimalist art (photography). I've cornered this building to show the upper floors of a building covered with a vertical-blind-like stucture that's built to cover the glass underneath. 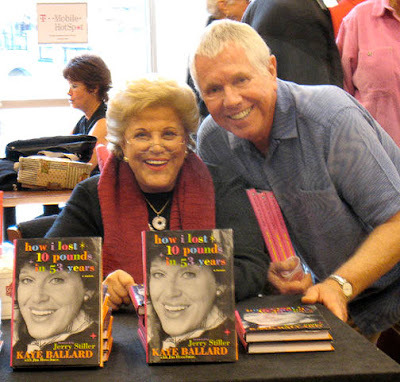 You might label Kaye Ballard as resident zero in Palm Springs. Her vitality sparks the future tripping people younger than her go through about getting older, asking the question, "Can I look like that at 80?" She's not the only super senior in town. This town's full of them--Carol Channing and Keely Smith of the over 70 set and Suzanne Somers and Barry Manilow of the hittin' 60 set. Since many of them are now authors, the town's jumpin' with new celebrity literature (fitness in Somer's case), book signing events and celebrity sightings. Getting creative in Palm Springs means (at least to some people) making a home can be a novelty. 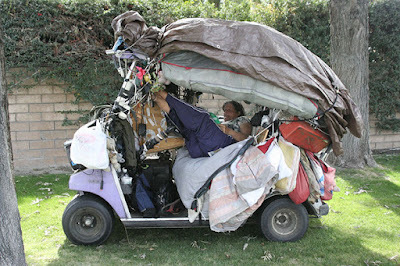 I mean, how many people do you know, or even who live in your town can say they've seen someone living in a golf cart? 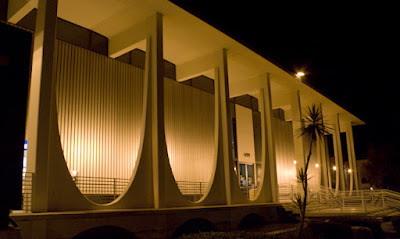 This would be part of Palm Springs High School. Since this town has less than 100,000 people, there's only one high school. Just looking at this image, one might think everyone here lives in a fantasy land. I mean look at the colors, they spill out into one's imagination. So clean, so crisp. And this is just the high school, the whole city has very strict architectural requirements. Even the Walmart is ultra modern. 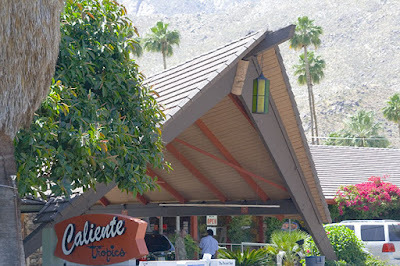 One of Palm Springs' charms is the mid-century modern architecture. The building above was eleventh on the list of 20 Top Desert Modernist Buildings in Palm Springs (the website is no longer there). The building, designed in 1961 by architect Stuart Williams, is located on the south end of what locals call "the Village," which is just another name for the downtown. Modernists and preservationists in town wrangle to save this as well as other building from demolition by developers and large corporations. 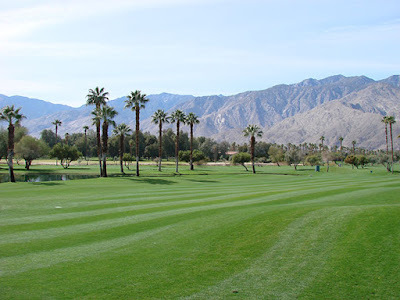 Yes, there are golf courses in Palm Springs, in fact in the whole Coachella Valley (the valley in which Palm Springs is located), there are about 125 of the green dreams. As a matter of fact, I can walk to three of them, each less than a mile away from my house. So why should I be writing about golf courses when I don't play? The answer lies in the open space that they preserve. There's a building boom here and the open space is disappearing fast. Near each golf course (or in it) there are bike paths. I do ride my bike (everywhere) as I have no car. The golf courses also have bodies of water--small lakes and/or natural streams--in or circumventing them. These act like mini-oasis, great places to see wildlife and some very beautiful plants. Palm Springs, California, a city with a history as rich as a thick chocolate cake, my home as well as the home of dozens of Hollywood stars throughout the years has a reputation of being wealthy and high-brow. Not to disappoint viewers of Palm Springs Daily Photo, but I start with a shot that could have been taken south of the border (a two hour drive from here to Mexicali in Mexico). 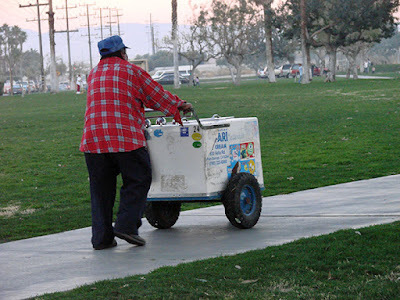 Humbling it is, having an ice cream vendor who pushes his cart up and down the street of my neighborhood, even downright colorful. The photograph, taken in Dumuth Park, a huge public playground where gays play softball and Mexicans play soccer is one multicultural experience. 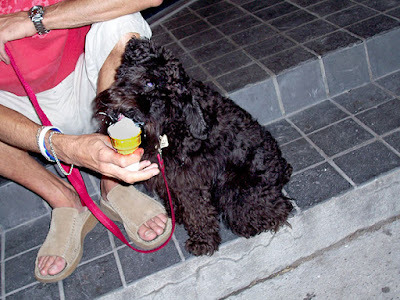 And the ice cream vendor is a trip to another time, even another place here in "wealthy" Palm Springs.